Lieutenant Colonel Walter William “Bill” Thompson was born on 29 June 1927 in Staten Island, New York. Bill’s military assignments (1945 – 1970) varied from such varied positions as instructor of Management in the ROTC Program at UCLA and the University of Arizona to Liaison Officer for the Commander In Chief (CINC), United States Armed Forces (USAF) Europe to the CINC, Group of Soviet Forces Germany, and subsequently as a VIP briefer on the Airborne Command Post. The European assignment to the CINC of Soviet Forces, East Germany, led to the award of the Airman’s Medal for heroism, involving seven incursions into restricted areas in East Germany in attempts to save the lives of American aircrew who had been shot down by Russian fighters. As the VIP briefer on the Airborne Command Post (1966 – 1969) Colonel Thompson briefed various important high level officials including two Presidents of the United States, Secretaries of State, Secretaries of Defense, and other military and civilian officials at the highest levels of the National command structure. His terminal assignment in the USAF was as Commander, 7499th Special Activities Group and as Senior USAF Intelligence Representative in Korea. His assignment to the United States Military Liaison Mission to the CINC of the Group of Soviet Forces, East Germany was unusual for Col Thompson in that he did not speak Russian, a normal prerequisite. This assignment was also unique in that they personally carried out the collection of intelligence without resorting to the use of nationals of other countries. This guaranteed the accuracy and timeliness of the intelligence. A number of “Firsts” resulted from these efforts. It provided the first photographs of the T-54 tank in an operational combat role, the first detail pictures of the T-76 tank, the first Fishbed aircraft, the first Fishbed “D” configuration, the first Fritter aircraft on the ground with full armament load, the first photos of Flashlight aircraft in a bomber configuration and virtually first photographs of every deployed soviet tactical aircraft radar. Colonel Thompson has held many other Honors, Awards, and Affiliations such as: Who’s Who in American Colleges and Universities – 1950, Distinguished Graduate Air Force Officer Candidate School – 1951, Who’s Who in Finance -1970, 1989-1982, and Investment Officer, Department of Arizona, American Legion and many others. Colonel Thompson was a Life member of TROA, now MOAA, and served as our 43rd Chapter President in 1997. Bill also served as the Chairman of the United Arizona Veterans (UAV) in 1997 and is a Life Member of both The Air Force Association and VFW. Colonel Thompson was inducted into the Arizona Veterans Hall of Fame in 2001. Colonel Thompson passed away on 16 February 2002, and is interned at Arlington National Cemetery, Arlington, Virginia, in Section 5-w, Row 1, Site 5. 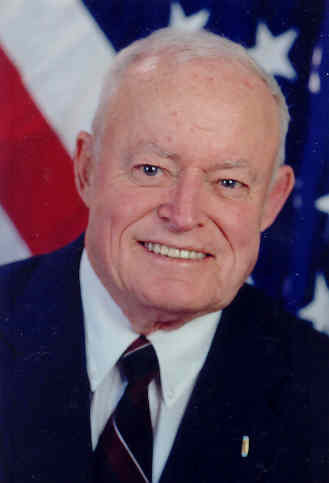 Bill was survived by his wife, JoAnne, who continued as a faithful member of MOAA until her passing on 25 February 2013. JoAnne is interned in the Okoboji Cemetery, Arnolds Park, Iowa.